This review first appeared in the November 2, 1992 edition of the North County Blade-Citizen (now North County Times). One of Africa's most popular artists, with a sizable following on both his native continent and in Europe, Youssou N'Dour is seeking to become the first African to conquer the American pop charts. It's a daunting goal, one that has eluded many talented artists  including King Sunny Ade, Fela Kuti, Miriam Makeba and Hugh Masekela, among others. From Senegal, on Africa's equatorial west coast, N'Dour plays his nation's popular music, mbalax. More westernized (and thus, perhaps, more accessible to American audiences) than Ade's juju or Fela's highlife (two popular musics of Nigeria), the mbalax of "Eyes Open" is ready-made dance music, with a strong backbeat, repetitive melody and tight horn charts. N'Dour is a gifted composer, and seemingly at home in a variety of settings, from straight-ahead dance numbers to introspective ballads. He's backed by a tight band here, and the production is clean with an excellent mix. Even with all those positives, though, it will be very surprising if N'Dour can get airplay given the narrow programming focus of American radio stations. 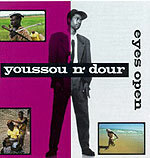 (Too, the lyrics are all sung in N'Dour's native tongue of Wolof. Remember the problems Linda Ronstadt had when she recorded an album in Spanish?) Without airplay, his chances of breaking into the top of the charts are slim. For those few fortunate enough to be exposed to him, though, N'Dour's syncopatic and intelligent music will be a welcome balm.